This is the second in a series of tips on writing what I call effective C. Today I’m addressing something that just about every embedded system has – a buffer whose length is a power of two. This is a useful extension because it allows me to control the resources used by the code without having to edit the code per se. However, this flexibility comes at a cost. What happens if someone was to inadvertently pass a non power of 2 buffer size on the command line? Well as it stands – disaster. However, the fix is quite easy. What I’ve done is define another manifest constant, RX_BUF_MASK to be equal to one less than the buffer size. I then test using a bit-wise AND of the two manifest constants. If the result is non zero, then evidently the buffer size is not a power of two and compilation is halted by use of the #error statement. If you aren’t familiar with the #error statement, you’ll find this article I wrote a few years back to be helpful. So is this effective C? I think so. It’s efficient, it’s flexible and its robustly protected against the sorts of bone headed mistakes that we all make from time to time. I find this frustrating, as I’ve consumed 8 lines doing what is more easily and elegantly performed in 1 line. I can’t say that I have any particular insight as to why the ternary operator performs so poorly. Perhaps if there is a compiler writer out there, they could throw some light on the matter? The bulk of the experimental data cover the temperature range of 5 – 48 degrees. I assumed that my experimental data covered the entire expected operating temperature range. I failed to check at run time that the temperature was indeed bounded to the experimental input range. 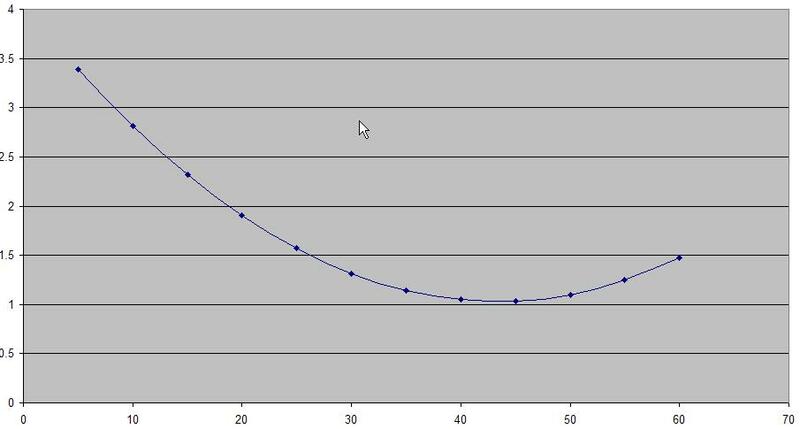 You can see that at 55 degrees, the polynomial generates a value which is about the same as at 25 degrees. Needless to say, things didn’t work too well! So what advice can I offer? Ensure that when fitting a polynomial to experimental data, that the experimental data covers all the possible range of values that can be physically realized. Always plot the polynomial to see how it performs outside your range of interest. In particular, if it ‘takes off’ in a strange manner, then treat it very warily. At run time, ensure that the data that you are feeding into the polynomial is bounded to the range over which the polynomial is known to be valid. There’s nothing really wrong with this approach. However, there is a better way, courtesy of vsprintf(). Is this more Effective code? I think so, for the following reasons. The higher level functions are now much cleaner and easier to follow. All the heavy lifting is localized in one place, which typically dramatically reduces the probability of errors. Finally, you’ll typically end up with a nice reduction in code size (even though this wasn’t my objective). All in all, not bad for one obscure function. The more embedded a product is, the better off you are with an EE, the less embedded it is, the better off you are with a CS. So what’s the basis for this overblown, sweeping generalization and what exactly do I mean by ‘more embedded’? It has no or very simple user interfaces. It performs a lot of hardware type functions in software. For example a DSP that performs a lot of signal processing is essentially doing in software what was once done in hardware. It contains a lot of complicated hardware that needs extensive configuration and software support (For example a PowerQUICC processor). Evidently there exists products that meet the criteria for both sides of the dichotomy. For example, my new flat screen TV has a very sophisticated user interface, but I’m sure it does an extensive amount of signal processing. A deeply embedded system written entirely by a CS major will have major problems. A lightly embedded system written entirely by an EE major may have major problems. On this basis, I prefer (slightly) to have EE’s work on embedded systems. It doesn’t take a rocket scientist to conclude that perhaps the best approach is to have a team where the EE’s handle the hardware centric stuff and the CS’s handle the computer centric stuff. Indeed, this is the approach I see taken in most organizations. As a final thought, although it is common to find EE majors that have gone back to college to get a Masters in Computer Science, I haven’t yet met a CS major that has gone back to college to get a Masters in Electrical Engineering.